It’s a story that’s probably as old as home recording. Band lose drummer and decide to reinvent themselves as an acoustic quartet. Band are quite taken with their new sound, and decide they’d like to document it before they recruit a new drummer. With no proper release planned, and no drum kits or loud amps to mic up, band opt to save money by recording themselves live. Band listen to the results with mounting disappointment and finally, realising there might be more to this recording business than meets the eye, they ask an engineer friend if he can put his mixing skills to work to sort out the resulting mess. 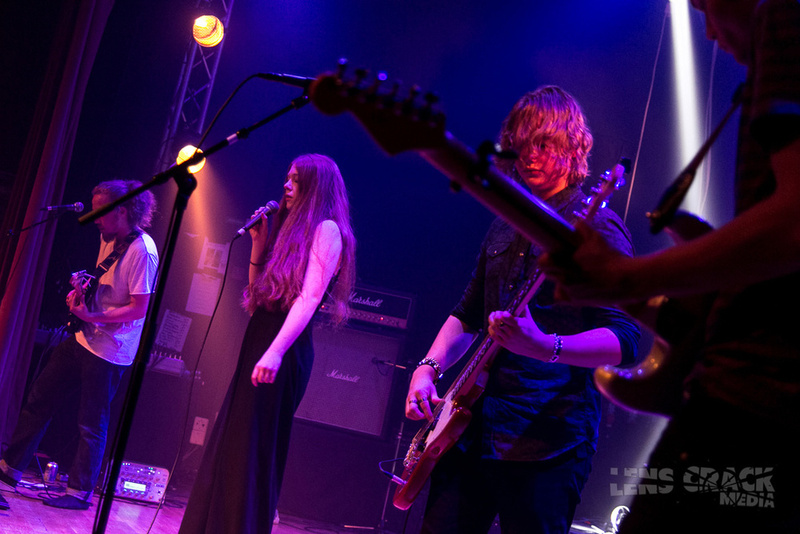 The band, in this case, are a Swedish indie-rock act called Please Keep Going, and for the acoustic recording in question, they had a line-up consisting of two acoustic guitars and an electric bass, plus lead and two backing vocals. They also had a portable multitracker and a bunch of cheap microphones, so it should have been straightforward to capture a decent representation of their live sound — shouldn’t it? Apparently not, because neither the band nor their engineer friend felt satisfied with the resulting recordings. As a last resort, they called on SOS to see whether a rescue was possible. Some of the things that arrive in the Mix Rescue inbox turn out to need surprisingly little work, but this definitely wasn’t one of them. The original mix was, just as I’d been led to expect, harsh and thin-sounding, with an aggressive acoustic guitar way out in front of everything else, a strange, phasey vocal sound, vague stereo imaging and little definition on the individual sources. 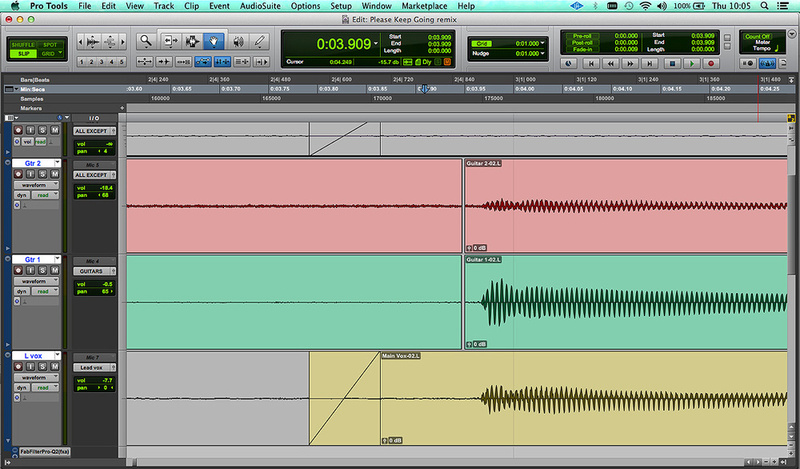 And on listening to the multitrack, it was clear that the mix engineer had done well to get it sounding that good! Small project, big trouble! 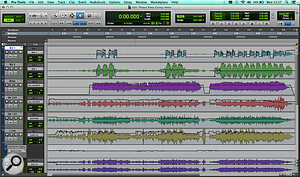 As you can see from this screenshot, the final mix required detailed automation of every fader, not to mention the EQ plug-in on the vocal track.For all its flaws, however, it was also clear that the multitrack contained a performance worth rescuing. The arrangement worked well, the band’s playing was in tune and in time, and it sounded as though frontwoman Linnéa had quite possibly turned in a killer vocal take. Which made it all the more unfortunate that said vocal take hadn’t been properly captured. The vocal was somewhat audible on the stereo room-mic track, but sounded very thin, and was buried behind the rhythm guitar. Said rhythm guitar also trampled all over the second acoustic guitar, which was playing mostly single-note lead lines and ornaments. The vocal was at least the loudest source on track labelled ‘Lead Vocal’, but only by a neck, and here too the tone was harsh. Spill on the two backing vocal mics wasn’t quite so bad, but their tone was skewed in the opposite direction, sounding muddy and lifeless, leaving the DI’d bass guitar as perhaps the only source that didn’t offer serious problems. With this kind of live-in-a-room recording, there are usually two basic approaches you can take. One is to treat the room mics as the core element of the mix, adding close mics only to the extent that they’re needed to correct the instrumental or tonal balance. The other is to work mainly with the close mics, treating the room mics as an optional natural ambience effect to help glue the results together. The original mix engineer had taken the first approach, so I began by doing the same. After a couple of hours’ experimentation, though, I decided I was never going to be able to overcome the problems that had defeated him. Both the balance of instruments and the spectral content of the stereo room-mic track, which had been recorded using the built-in mics on a Zoom multitracker, were so far away from being a coherent representation of the band performance that no amount of EQ or dynamics processing could bring them into the realms of the acceptable. It was also clear that the room mics were the main source of the unpleasant ‘phasey’ vocal sound. So, without much regret, I muted them and turned instead to the close mics. Some spill is inevitable in a live recording and, up to a point, it can have beneficial consequences. The trouble was, that point had been left so far behind here that it wasn’t even visible in the rear-view mirror. So prominent was the rhythm guitar in the other mics that, from a balance point of view, I could happily have muted its own mic. In fact, this might have been a practical option if its spill into other mics was of the good-sounding variety that adds a subtle sense of depth and presence to an instrument. It wasn’t. It was spill of the nasty, splashy comb-filtered flavour that you’d normally avoid at all costs. Somehow, I would have to square the circle of making the rhythm guitar’s close mic loud enough to overshadow, or at least soften, its spill into other mics, without also drowning out the wanted audio in those other mics. Zoomed in both horizontally and vertically, this screen shows the first note of the rhythm guitar, as it appears on its own track (centre), the lead vocal track (bottom) and the second guitar track (top). The edits on the guitar tracks show that those parts have been slipped by a few samples, so as to time-align the guitar across all three. As you can see from the waveform, the second guitar was also quite noisy!In any multi-miked recording where spill is significant, the first thing to do is usually to check for phase issues when the mics are combined. This is best done in mono and, for diagnostic purposes, I often find it helpful to temporarily adjust the faders so that the instrument you’re concerned about is at roughly the same level in all the tracks you’re comparing. In this case, there were three such tracks: the rhythm guitar itself, the lead vocal and the second guitar. By inspecting the waveforms in Pro Tools, I convinced myself that the absolute polarity of the guitar signal was the same in each of these. I then set about making small adjustments to the relative timing of the tracks — of the order of a few tens of samples — initially with the thought that perhaps polarity could then be flipped on one track to cancel out some of the guitar spill. Unsurprisingly, this didn’t work, but a couple of small nudges to the timing did seem to me to improve the overall guitar sound when the three tracks were blended. The rhythm guitar spill onto other tracks was harsh and over-bright, so although these severe EQ cuts on the guitar track sounded odd in isolation, they went a long way towards creating an overall guitar sound that was balanced.The pitfalls of soloing tracks to EQ them become veritable Grand Canyons when you’re working on a live recording, because as soon as you disengage the solo button, your carefully crafted instrument or vocal tone will be completely altered by the contribution of its spill onto other tracks. In this case, the rhythm guitar’s own mic didn’t sound too bad, but the spill was adding plenty of harsh upper-mid content. Cutting those frequencies on the vocal or the second guitar track would have had too much of an impact on those sources, so I opted to make quite a deep cut between 2 and 4 kHz on the rhythm-guitar track. Likewise, pick noise that might have been acceptable in solo was being exaggerated by the spill, so I set up a compressor with very fast attack and release times to tame it on the guitar’s own track. That was the easy bit. I was now faced with the challenge of lifting the vocal above the rhythm guitar, and compensating for the rather gutless sound of the vocal itself. This, I think, would actually have been impossible if it hadn’t been for the fact that the two goals were partly complementary. What was most intrusive about the guitar spill was its percussive, splashy, scratchy high-frequency content; and what needed rectifying most about the vocal sound was its thin, harsh tone. This meant that, on the one hand, I could afford to lose some top end from the vocal if it helped duck the guitar spill, and on the other, any low-mid richness I could add to the vocal sound wouldn’t bring up the guitar spill too much. 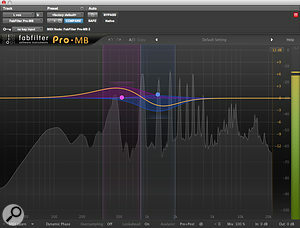 Two instances of FabFilter’s Pro-MB at work on the vocal track. The high-frequency compression in the first one is triggered from the rhythm guitar. Note that despite the extreme Ratio and Knee settings, the Range control ensures that no more than 3dB of gain reduction can take place. In the second, the lower of the two bands is configured as an expander, boosting 500Hz only when triggered by the vocal signal.To compound the problem, the vocal performance was fairly dynamic and, as is often the case, this meant the tone wasn’t consistent. In the quieter sections, a fairly hefty low-mid boost was needed to restore a fairly natural vocal sound; in the louder sections, however, the same degree of boost made the vocal tone muddy, and an unappealing honk was evident further up the frequency spectrum. What’s more, although the low-mid boost was fairly benign with respect to the guitar spill, it made all too audible that there was also spill from the backing vocals and bass guitar onto the vocal track. 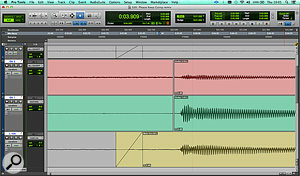 In other words, the vocal track presented a moving target, with the processing required changing to reflect what the singer and the other musicians were actually doing from moment to moment. 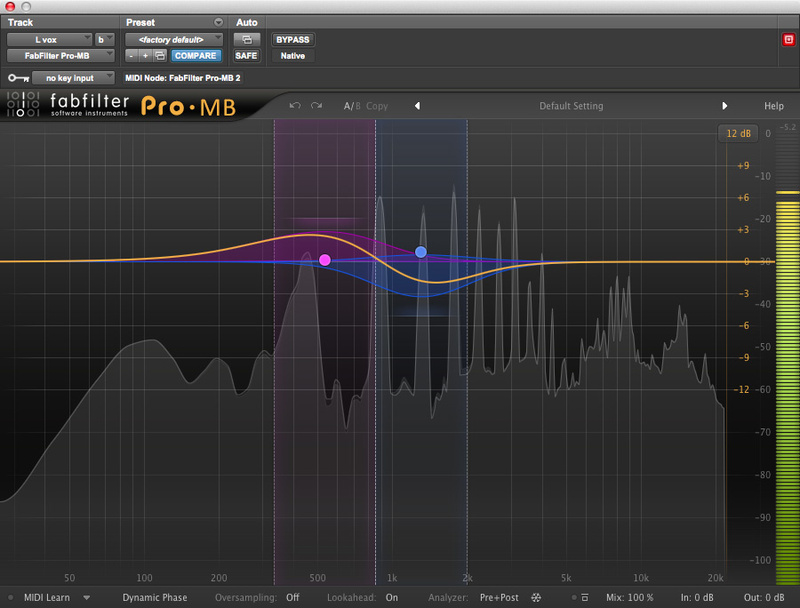 After a great deal of trial and error, the compromise I settled upon involved several different elements, with most of the hard work being done by two separate instances of FabFilter’s invaluable Pro-MB multi-band dynamics tool. To tame the nasty pick attack that was the most prominent component of the guitar spill, one of these was set up to trigger a cut from 3kHz up whenever a side-chain signal from the guitar track exceeded the threshold. Pro-MB’s Range dial allows you to specify the maximum amount of gain reduction that will be applied on a per-band basis, which is very useful in this sort of situation; I could set the knee, ratio and time-constant parameters very aggressively to ensure that every guitar strum triggered the compressor, yet limit the amount of compression that was being applied, so that it all sounded fairly transparent. I ended up with the Range control set to dial in a relatively small 3dB of gain reduction, which represented the best compromise between reducing spill and damaging the vocal sound. 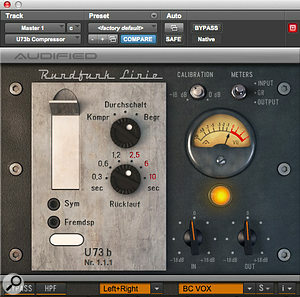 The second Pro-MB instance was set up to improve the vocal sound itself, in a way which made use of some of this plug-in’s other unique features. 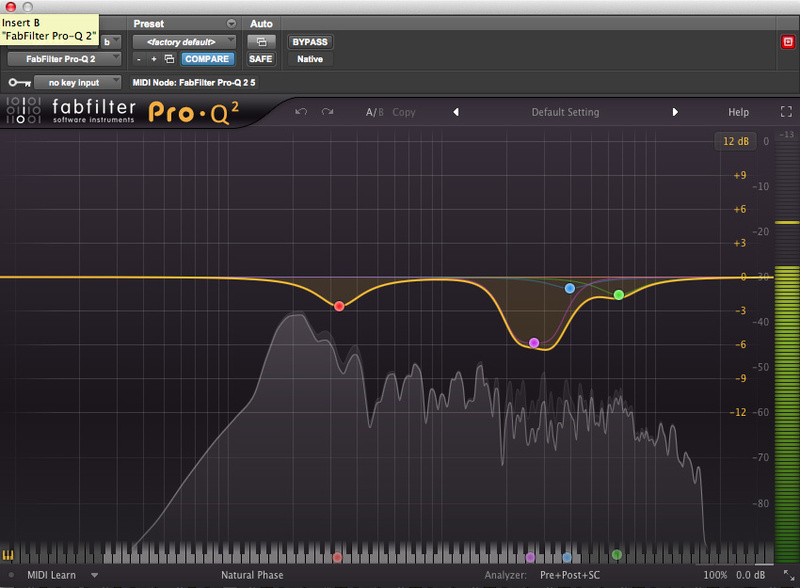 To tame the honkiness, one frequency band was configured as a conventional peak compressor centred around 1.4kHz, with the threshold set relatively high so that compression took place only on loud notes. 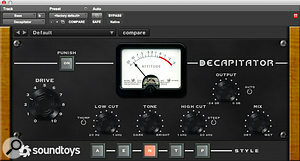 In order to bring out the low mids more fully, a second band centred at 500Hz was set up as an expander rather than a compressor. The idea was to set the threshold so that no gain boost took place in the gaps between vocal phrases, but that the vocal itself would exceed the threshold and trigger this boost. Again, the Range control was used to firmly limit the amount of boost that could be applied, as only 4dB or so was needed in the loud bits. 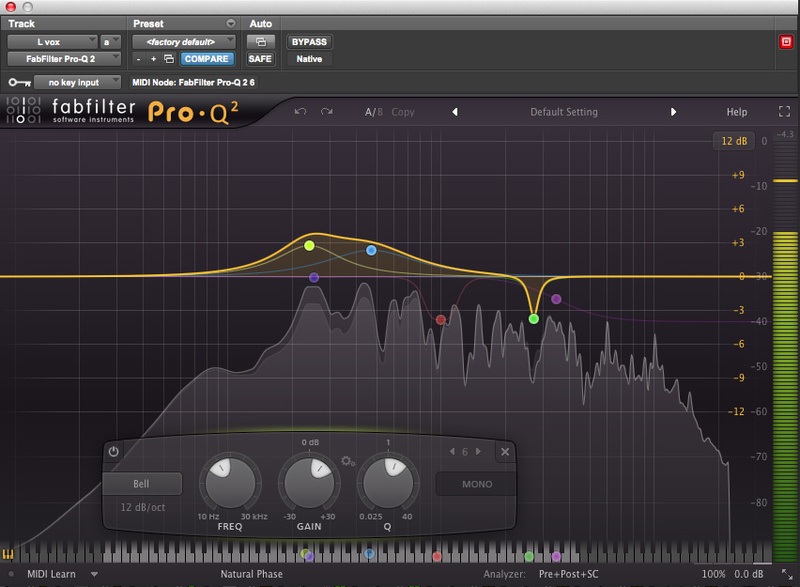 To apply the further boost that was required in the quieter vocal sections, I automated two bands of an EQ plug-in, centred at 240 and 560 Hz. The former is a frequency I don’t think I have ever before boosted in my life, so I was a bit nervous about doing so here, but it seemed to have the desired effect. 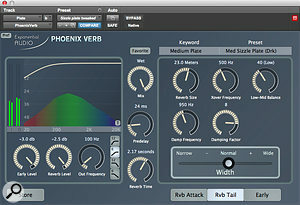 Finally, a dark-ish plate reverb from Exponential Audio’s Phoenix Verb seemed to complement the soulful performance without drawing unwanted attention to sibilants, and to complete the vocal treatment, I applied some fairly conservative compression and de-essing, accepting that most of the work of controlling the level would have to be done using fader automation. This was a real juggling act: since quite a bit of the rhythm guitar’s presentation in the final mix was coming from the spill on the vocal track, I often needed to compensate for fader moves on the vocal track by adjusting the level of the guitar track too. 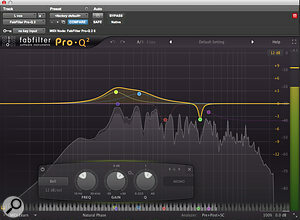 EQ was used to add further low-mid boost to the thin vocal sound, but the gain of the 240Hz band was varied using automation, as this wasn’t needed all the way through the song.In contrast to the lead vocal and the rhythm-guitar parts, the backing vocals and second guitar were dark and muddy rather than over-bright. However, their tone was relatively consistent so, after some fairly swingeing EQ cuts in the low mid-range, getting them to sit in the mix was mainly a matter of fader-bashing and level automation. Apart from the vocal and bass, all the instruments had been recorded with dynamic mics into fairly cheap and cheerful preamps, and as I brought them into the mix, I began to agree with the original mix engineer that they were uncomfortably noisy. He had actually sent me separate versions of all the tracks with and without noise reduction applied, so I loaded the noise-reduced versions onto separate Playlists on my Pro Tools tracks. The noise reduction had been handled very sensitively, so there were no warbling or chirping artifacts, but I found that if I switched all the tracks to the noise-reduced versions, the whole mix began to sound a bit dead and lifeless. I compromised by switching only the worst offenders, which were the two guitar tracks. 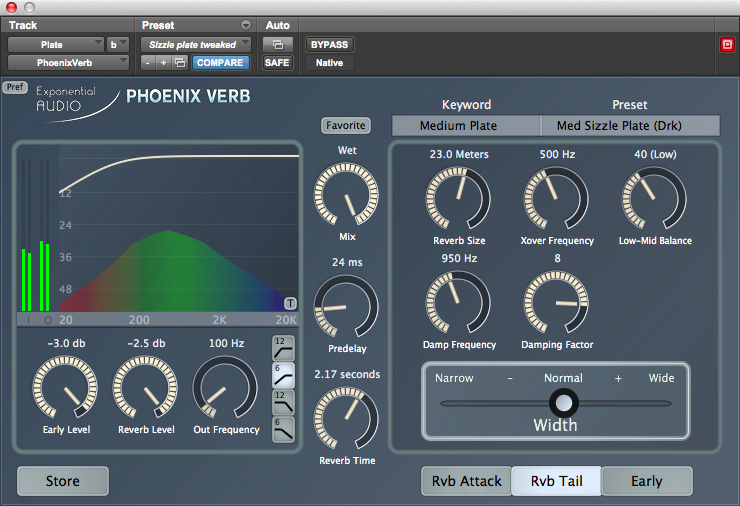 A plate reverb from Exponential Audio’s Phoenix Verb presented a very different and much more attractive alternative to the ambience of the room mics!On first listening to the multitrack, I had mentally identified the electric bass as the one instrument that ought to be straightforward to deal with. It was well played, in tune, and thanks to the wonders of direct injection, free from the spill that blighted the other tracks. Yet when it came to it, I found it surprisingly difficult to get it to ‘sit’ in the mix. Because nothing else really occupied the same frequency band, the bass was quite exposed and it always seemed either too loud or too quiet! It didn’t help that the DI’d tone was a bit cold, clinical and detached, and I experimented with various saturation and amp simulation options to try to warm it up. I also gave it quite a bit of the short ambience reverb I was also using on the guitars. And even after that, quite a bit of level automation was needed to keep it in its place. 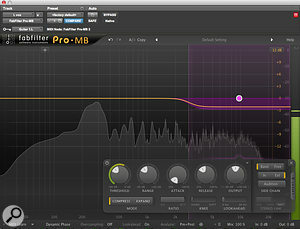 The DI’d bass proved surprisingly hard to get right, despite the attentions of multiple ‘analogue warmth’ plug-ins. 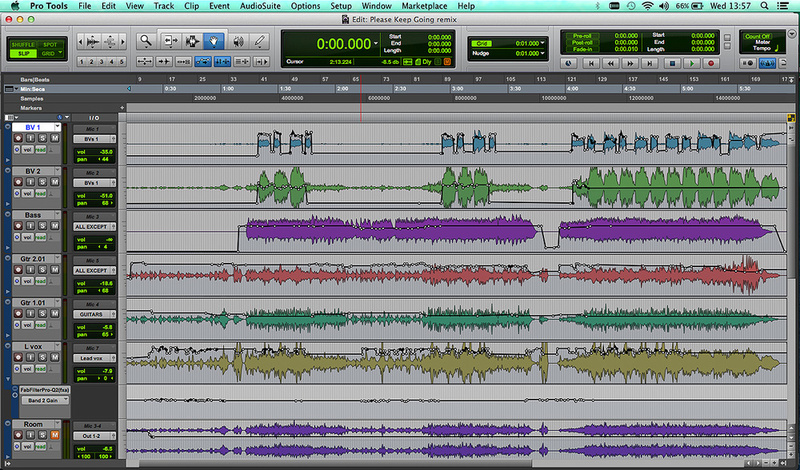 Now that we all have the blessing/curse of total recall, it’s often hard to know when to stop mixing. You can keep on revisiting your mixes ad nauseam and, eventually, you’ll end up wasting time on minutiae that no listener will ever notice, or chasing your own tail trying to fix things that can’t be fixed, and eventually undermining your confidence in your original decisions. I reached all of those stages on this project! When I came out of the other side, I found that in addition to all the processing I was using on the individual tracks, I’d ended up with no fewer than nine plug-ins on the master bus, and all of them seemed to be having a positive or at least benign effect. Two EQs were deployed to make a number of narrow dips, tackling general harshness and stray peaky frequencies that emerged once all the tracks were combined. 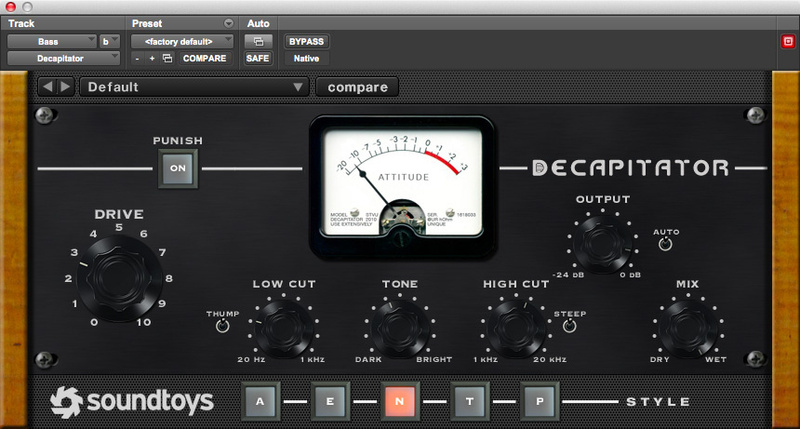 Yet another multi-band compressor was set up to try to keep the overall tonality more consistent throughout the song, while de-essing the master bus slightly seemed beneficial both for the vocal and the pick noise. I had also added Audified’s U73b compressor, in limiting mode, when testing it for review, and decided I liked it, perhaps more for its tonal contribution than for any gain-reduction it was doing. Finally, prior to hitting my output limiter, I made an attempt to warm the whole thing up using Slate’s Virtual Tape Machines and SoundToys’ Radiator. The whole thing took far longer to mix than a project containing seven tracks should, and even after hours of work, I don’t think anyone would mistake the outcome for a well-recorded production. This was a recording that hovered on the brink of being unmixable, and on several occasions I came close to throwing in the towel. If I got it to sound anywhere close to acceptable (have a listen to the examples at http://sosm.ag/jan16media and judge for yourself! 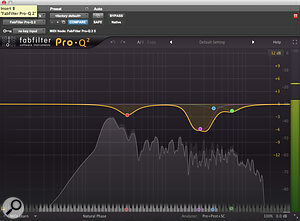 ), that was possible thanks to techniques that are exclusive to mixing ‘in the box’, such as very precise automated EQ and multi-band dynamics. In the end, thankfully, the band thought the remix a big improvement — but the difference I could make as mix engineer is nothing compared with the difference they could have made by an hour’s work on mic placement. Fixing things in the mix is possible up to a point, but it’s never the best way! There’s something about room mics that bugs me, as a mix engineer. On the one hand — and I realise this sounds a bit silly — I feel as though I have almost a moral duty to use them, if they’re recorded. Of all the mics on the session, the room mic is the one that comes closest to representing what a real human listener would hear of the performance, so ignoring that representation feels like ignoring the truth. Yet on the other hand, room mics often sound plain bad to me. Even when the tracking engineer has used good mics in sympathetically chosen positions within a nice-sounding space, I often struggle to find a use for the results at mixdown. The Please Keep Going multitrack presented this dilemma in full force. Here was a band who could clearly play, recorded live as an ensemble. If there was ever a time for room mics, this was it. Yet despite my best efforts, I couldn’t convince myself that adding the room mics back into the mix was really making things any better. I tried delaying the other tracks so that they were time-aligned with the room mics; I tried delaying the room mics to make them sound more distant. 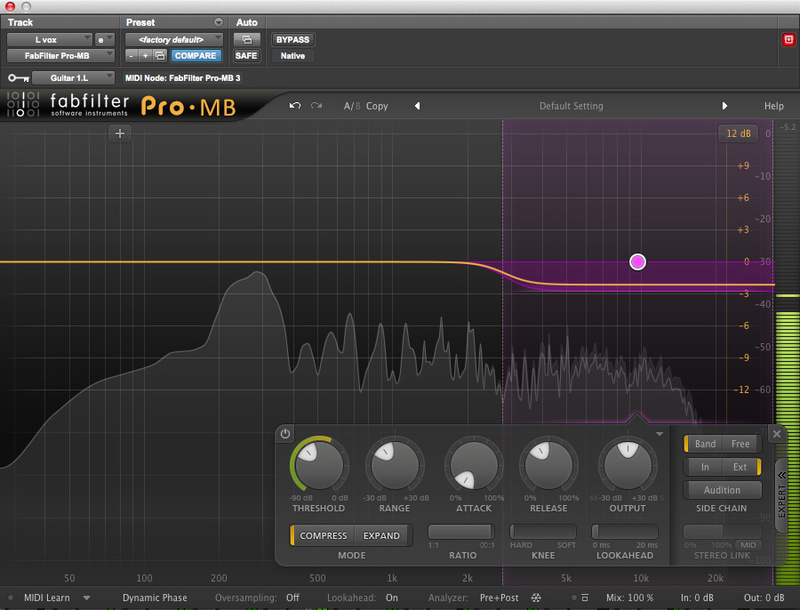 I tried equalising them and compressing them and de-essing them, but nothing helped. Using the room mics at an audible level also tied my hands regarding panning, so in the end, I simply muted the room-mic track. Feedback from the band and their engineer suggested they were happy with the remix: “I really like what you did with her voice, it sounds clean, warm and smooth. I had a major issue with it being too harsh at different places in the song. I don’t know how you did it, but you got rid of the bad room sound. And also managed to get the thin-sounding guitars to sound more full, but without losing the clarity and not muddying them up too much. Please Keep Going are an indie-rock band that formed in early 2015 in Stockholm, Sweden. Playing their own version of indie music, Please Keep Going have been writing away, building up a catalogue of songs. The original drummer left during the summer, and so the band decided to focus on playing and recording acoustic versions of their own songs. The band now consists of Linnéa (lead vocals), Andreas (guitar), Martin (bass, backup vocals), Jesper (guitar, backup vocals) and André (drums). With the drummer position filled again, they are entering the studio in November to record their debut EP, and are aiming to release it in early 2016.